Batman is lying in the batcave. The drugs that Robin and Azrael recovered from Gordon is all that stands between the Dark Knight and the ability that he may never walk again. Robin talks about how this is all his fault. He saw that Batman was headed for a breakdown and he did nothing to stop it. Robin begins to tell the tale of how before Bane broke Batman's Back Batman had a run in with Two-Face. Two-Face is in Gotham after being sprung by Bane from Arkham. He goes to an old mob boss that he had the goods on. Two-Face tells the mob boss that there is no way his evidence would stick in court but it is very dangerous info to have just lying around. 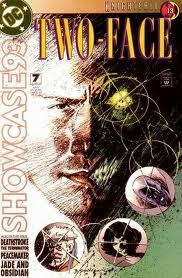 Two-Face kills the mob boss and takes his men to form a new gang. Thirteen in total for his new gang. Two-Face shoves the body in a Gotham museum and trip the alarm so the Gotham City Police Department and Batman both show up. After finding the body Batman remembers that when Two-Face was D.A. Of Gotham this one the one Mobster that he had info on but could never bring to court. Batman goes back to the Batcave to plan his next step. Robin and Batman traces Two-Face back to the club the now dead mobster ran. Robin wants to go but Batman says that since he is burning out that he has no time to watch Robin's back as well as his own. Once at the club Batman finds himself surrounded by three large guards. Before they attack Batman begins to re-think if leaving Robin behind was such a good idea. A fight breaks out, which Batman barely wins. One of the goons gives up the address to which Two-Face is hold up at. While driving across a bridge to get to the other run down side of Gotham Two-Face blows a hole in the bridge. The giant whole causes the Batmobile to fall into the water below and Batman is captured by Two-Face soon after. Unbelievable! The batmobile should be aquatic and Batman shouldn't have got caught! That's like something that could have happened in the Silver Age of Batman comics.